Definition at line 37 of file listener.h. Definition at line 48 of file listener.cpp. Reimplemented in LLListener_DS3D, and LLListener_FMOD. Definition at line 154 of file listener.cpp. Definition at line 62 of file listener.cpp. Definition at line 85 of file listener.cpp. Definition at line 137 of file listener.cpp. Definition at line 126 of file listener.cpp. Definition at line 79 of file listener.cpp. Definition at line 148 of file listener.cpp. Definition at line 91 of file listener.cpp. Definition at line 53 of file listener.cpp. 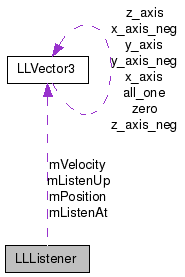 References DEFAULT_AT, DEFAULT_UP, mListenAt, mListenUp, mPosition, mVelocity, LLVector3::setVec(), and LLVector3::zeroVec(). Referenced by LLListener_FMOD::init(), and LLListener(). Reimplemented in LLListener_DS3D, LLListener_FMOD, and LLListener_OpenAL. Definition at line 103 of file listener.cpp. Referenced by LLListener_FMOD::orient(), LLAudioEngine::orientListener(), and set(). Definition at line 110 of file listener.cpp. References mPosition, mVelocity, orient(), setPosition(), and setVelocity(). Definition at line 132 of file listener.cpp. Definition at line 121 of file listener.cpp. Definition at line 73 of file listener.cpp. Referenced by set(), LLAudioEngine::setListenerPos(), and LLListener_FMOD::setPosition(). Definition at line 143 of file listener.cpp. Definition at line 97 of file listener.cpp. Referenced by set(), LLAudioEngine::setListenerVelocity(), and LLListener_FMOD::setVelocity(). Definition at line 67 of file listener.cpp. Referenced by LLListener_FMOD::translate(), and LLAudioEngine::translateListener(). Definition at line 43 of file listener.h. Referenced by getAt(), init(), orient(), LLListener_FMOD::setPosition(), LLListener_FMOD::setVelocity(), and LLListener_FMOD::translate(). Definition at line 44 of file listener.h. Referenced by getUp(), init(), orient(), LLListener_FMOD::setPosition(), LLListener_FMOD::setVelocity(), and LLListener_FMOD::translate(). Definition at line 41 of file listener.h. Referenced by getPosition(), init(), set(), setPosition(), LLListener_FMOD::translate(), and translate(). Definition at line 42 of file listener.h. Referenced by init(), set(), and setVelocity().